Hello as you know Christmas is near!!! So excited!! I want to show you some simple nail art for the big day! Looks great on long or short nails so don't worry if yours are a bit short! Of course you can just apply Christmas theme colours (I do this when i am not in the mood for detailed work:D) so refs, greens, white, gold, silver etc. First you want to apply a Base Coat to make sure your nails are protected and the paint lasts longer. Next carefully ad a layer of red nail polish on your nails (normally red nail polishes are very pigmented so you probably only need 1 or 2 coats. Thirdly you need to pieces of tape to form a triangle, as you can see it the picture, easier than you would've thought right?! 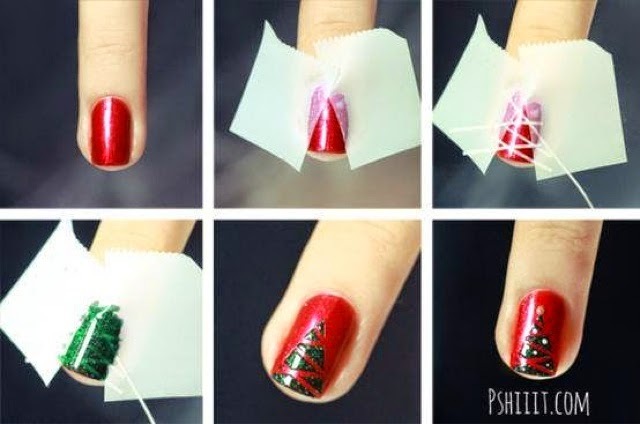 After add thin layers of tape randomly across your nail,going between the two layer pieces of tape. Apply green nail polish on. Take of tape one by one starting with the one on top,after 10 seconds.